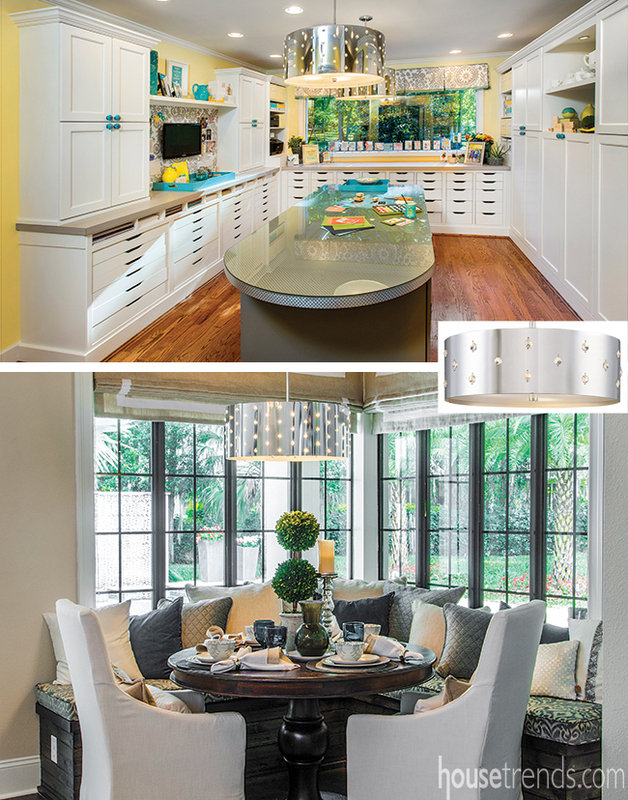 The Corbett Lighting Cesto Chandelier makes an appearance in both of these Tampa dining spaces. In high school, two of my closest friends showed up to senior prom wearing the exact same dress. After the initial shock wore off everyone had a good laugh, the night went on, and we ultimately had a great time. We even took a group photo (which I still have, by the way) and made sure to strategically separate the two of them for the picture. 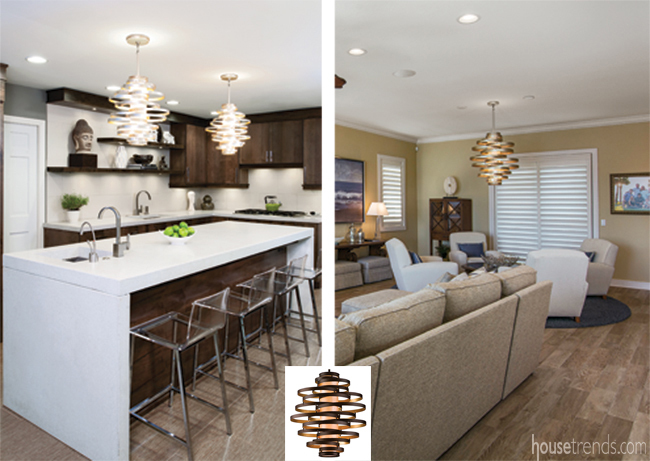 This memory came to light recently when the Housetrends staff came across a light fixture that we featured in two different homes in completely opposite parts of the country. 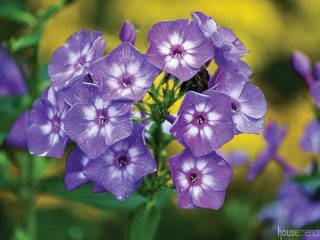 Both spaces were equally beautiful, but profoundly different in style. 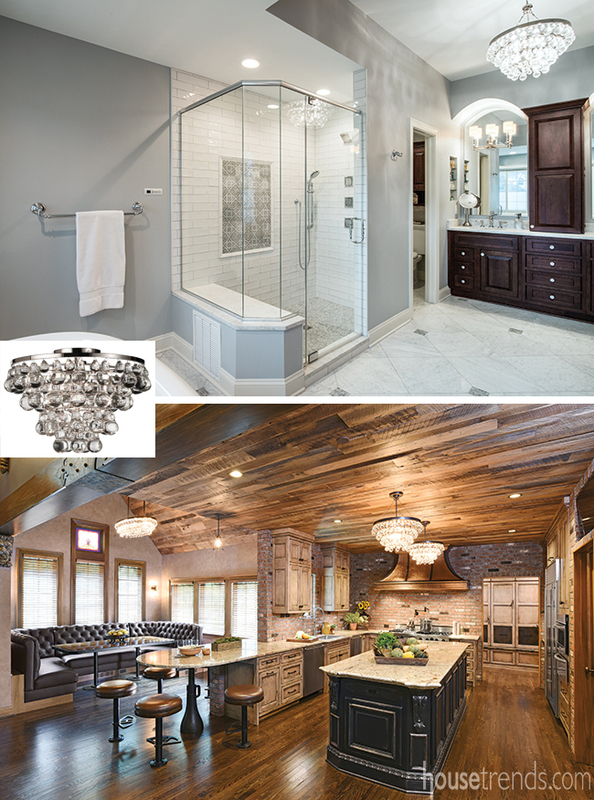 That discovery escalated into a hunt to find other projects featuring the same materials or products—resulting in Housetrends’ very own version of Who Wore It Better? 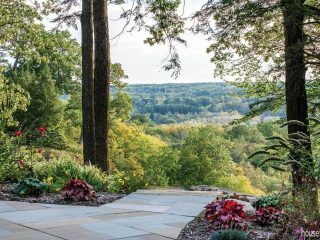 The Vertigo, one of Corbett Lighting’s signature pieces, seems to stand the test of time. 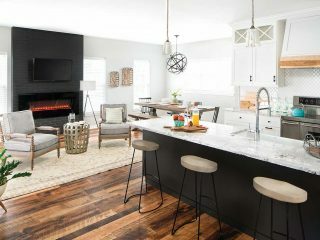 Two of the eclectic pendants add a touch of glamour to this stylishly contemporary kitchen in Pittsburgh, Pennsylvania. 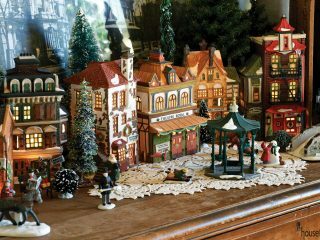 The fixture also looks great in a traditional setting. Its unique intertwining circular rings complement the inviting seating area in this Tampa, Florida home. Talk about having a chameleon-like quality. While considered to be a contemporary fixture, the Robert Abbey Bling light can adapt to any décor. 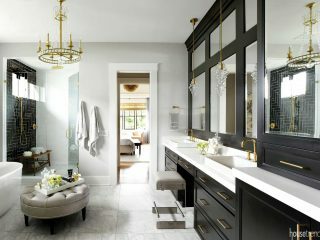 The flush mount version adorns this sleek master bathroom retreat in Cleveland, Ohio, while its chandelier counterpart hangs in the vintage-inspired Columbus, Ohio kitchen; drawing eyes up to the glistening glass drops comprising the unique fixture. Part art deco, part modern marvel, Crossville’s Sideview glass tile creates a 3-dimensional backsplash that takes command of a room. 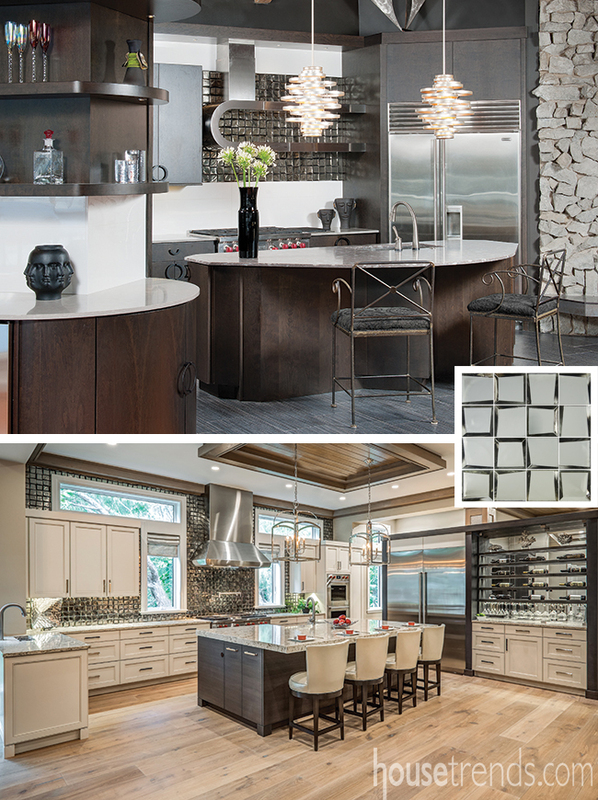 Set behind two impressive range hoods—one in Pittsburgh, Pennsylvania and one in Longboat Key, Florida—the polished metallic tile establishes two distinctly different focal points. 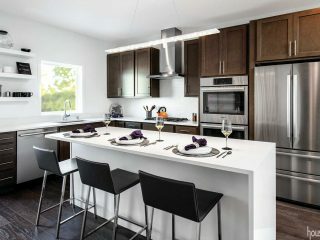 This kitchen also features Corbett Lighting’s Vertigo pendants, another contender seen on the previous page. 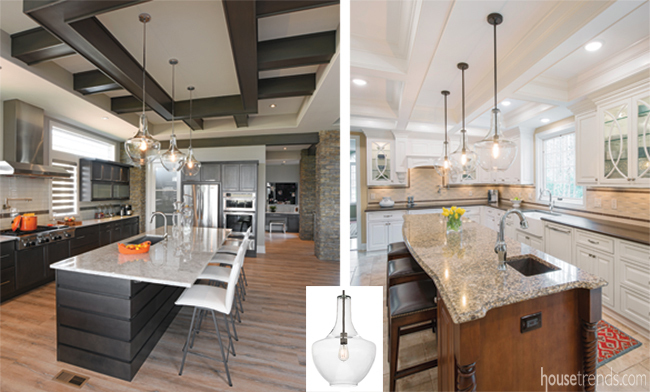 A trio of Kichler Everly pendants looks right at home in a variety of interior design styles. 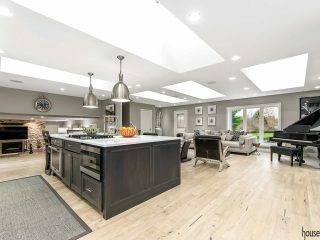 The large clear seeded glass fixtures hang above two completely different kitchen islands. 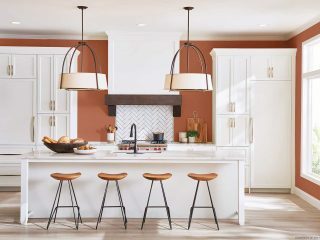 Three pendants in a bronze finish bring out the rich cherry stained cabinetry in a traditional kitchen in Cleveland, Ohio, while chrome versions pull from the modern design depicted in Dayton, Ohio. You wouldn’t think that a laundry room sink could hold its own as a unique design piece in a guest bathroom. 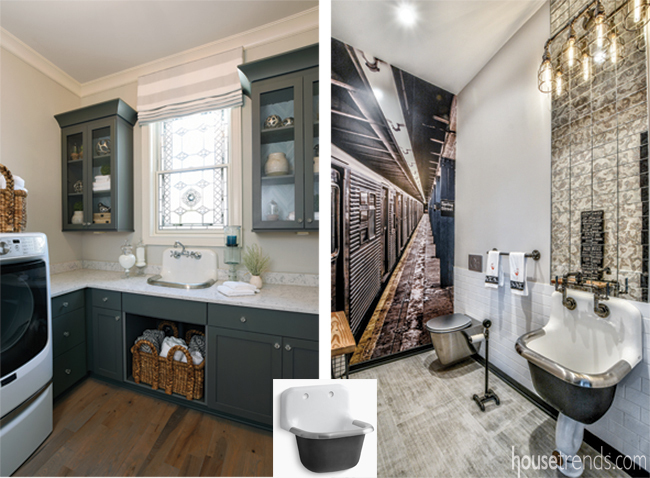 But the Kohler Bannon service sink fits right into a variety of surroundings, including an oversized laundry room in Cincinnati, Ohio and a captivatingly artistic bathroom in Pittsburgh, Pennsylvania. Bling Bling—such a fitting name for a glitzy light fixture. The drum pendant features a steel shade that is perforated and adorned with crystals for a touch of sparkle. 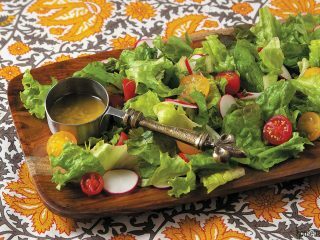 The dramatic light works well in any situation, including a one-of-a-kind craft room in Cincinnati, Ohio and a cozy breakfast nook in Tampa, Florida. 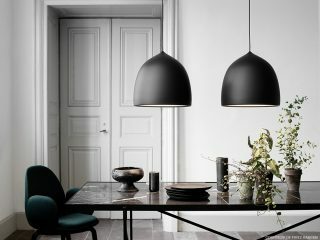 The perfect light fixture can transform a dining area from monotonous to exciting with the flip of a switch. 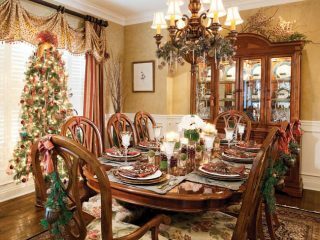 These two dining spaces might call Tampa, Florida home, but their design aesthetic couldn’t be more different. 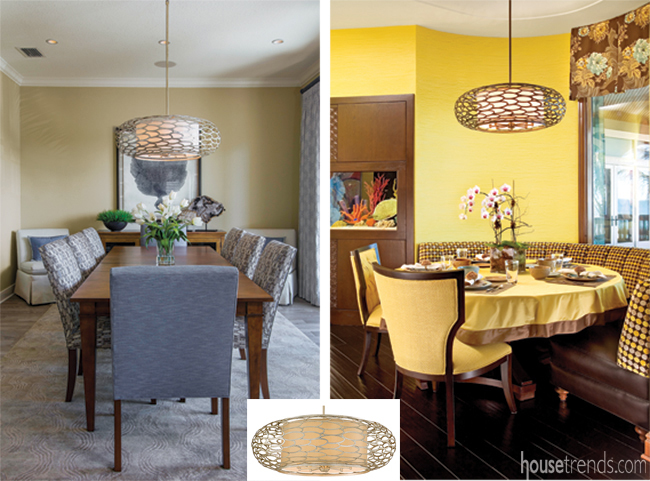 The Cesto with a Napoli Bronze finish pops against the yellow walls in the invigorating breakfast nook, while the Modern Silver version of the drum pendant blends perfectly with the elegant décor in the formal dining room.